Community effort restores flow of San Bernard River. Roy and Jan Edwards knew it was a good place to be when they left the hustle and bustle of Houston five years ago to settle here. One hundred eighty years ago, Stephen F. Austin, the father of Texas, knew it was a good place, too. He land-granted some of Texas’ original 300 here, and was buried here at age 43, in a cemetery near his sister’s Peach Point Plantation, not far from Roy and Jan’s house. In the winter, when the wind is just right, the river makes a haunting sound like a ghostly violin. This community, once booming in the 1970s with shrimpers, was dying, and its death knell in the winter wind would have echoed for eons were it not for a few determined souls who saved the river. Between the mighty Brazos and Colorado Rivers runs the San Bernard River, a 120-mile riverine system that starts in Texas’ Post Oak Savannah with a spring near New Ulm, runs through the heart of the Columbia Bottomland, and ends where Roy and Jan live, appropriately named River’s End. This is where the San Bernard would empty into the Gulf of Mexico. But four years ago, the river finally really did end here. The reasons for the dying river were engineered by man. 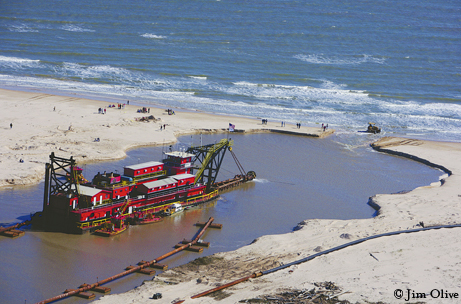 A Corps of Engineers’ channelization project 80 years ago moved the mouth of the Brazos River 10 miles closer to the San Bernard, and thereby created a series of unintended hydrological consequences: When a delta formed at the Brazos River’s new mouth, the sands swept down the coast across the mouth of the San Bernard. Without the power to spew the new sands into the gulf for its own delta, the San Bernard developed an extended mouth, resembling a chicken neck, along the coast. Over the years, the neck became longer, shallower and narrower. By 2000, the mouth was un-navigable. Shrimpers couldn’t reach River’s End. The economy of this little community went bust. That’s not all that was gone. On the weekends, the boat launch was empty. Recreational fishermen had found better fishing grounds. Bait camps and bars closed. Neighbors reported that flounder and croaker had reduced in size and number since the closing of the river, and residents had not seen a run of flounder to spawn in the gulf since the mouth had closed. For those who wanted to retire to a sleepy community, they certainly had one. They also had a dying community. By the spring of 2005, the San Bernard River no longer reached the sea. The closing of the river mouth ultimately meant that the marshes and estuaries associated with the river were threatened. And, if the ecosystem of the region were to be sustained, the pass would have to stay open. Roy and Jan Edwards were familiar with rivers. 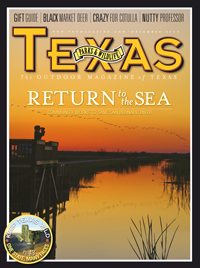 For 25 years they had paddled many of Texas’ rivers, creeks and bayous. During 15 of those years, Roy served as Commodore of the Houston Canoe Club. While Roy is comfortable with any position in or near the water, Jan’s feelings about water are a mixture of fear and love. That mutual love for a river led the Edwardses to retire to River’s End in 2004, in a former shrimper’s house on Music Bend where the wind whistles over the oyster beds during low tide in winter. 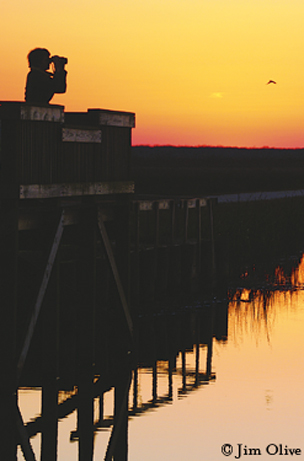 Their dock is on the San Bernard, overlooking the coastal marshes where white pelicans and snow geese flock in January and February. 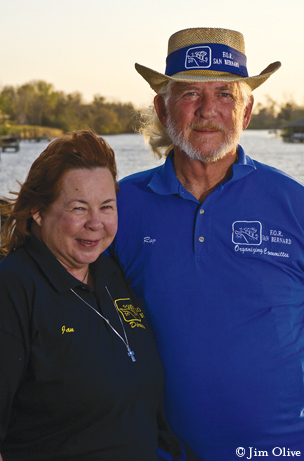 In their new life, Roy and Jan found residents who, like themselves, loved the river, were joined as a community because of the river, and had done some things to protect it. A group of residents upriver had successfully led the effort to prevent Conoco/Phillips from shipping fly ash by barge down the San Bernard. That’s when the Edwardses pitched in and started leading efforts to re-open the San Bernard. Their successful petition during an April 2005 trash bash produced 1,700 signatures — enough votes to swing any election in Brazoria County. Not only did the petition drive get the attention of local officials, it led the community to form a grassroots organization, F.O.R. (Friends of the River – San Bernard), which worked in many ways to promote opening the river. The community’s seemingly circuitous efforts — visiting Washington, meeting with officials at all levels, writing letters and holding local meetings — culminated in a solution from the very people who had created the problem: the Corps of Engineers. In September 2006 Assistant Secretary of the Army John Paul Woodley Jr. came to inspect the Brazos/Freeport region with just one hour to see the situation at the San Bernard River. After Roy walked him across the beach and showed him the closed mouth, Woodley went back to Washington resolved to re-open the San Bernard. Only around 6,000 piping plovers (Charadrius melodius) exist in the world, with two of the three populations relying on the Texas coast for their winter habitat. The Great Lakes piping plover (endangered) and Great Plains piping plover (threatened) have a north-south migration pattern, summering in Canada and the Great Lakes region, and wintering along open beaches in Texas, like those of San Bernard. Each year the plovers return to the same section of a beach and work the shore side, feeding in intertidal areas on small invertebrates such as worms and insects. Then, depending on the tide, they’ll work the island’s bay side, generally within a 3-kilometer range of beach and bay. Texas’ open coastal areas are generous to this little shorebird’s existence. More than 100 piping plovers have been counted in _several locations along the Texas coast, the highest congregations on record. Look for piping plover in San Bernard NWR, Galveston Island State Park, Mustang Island State Park and Matagorda Island Wildlife Management Area. For the Corps, at risk were the Gulf Intracoastal Waterway (GIWW) gates they managed at the Brazos River. Now that the San Bernard’s mouth was closed, the river’s currents had no place to go but up the GIWW channel, putting pressure on the Brazos River’s west gate. To alleviate the pressure from high currents and continuous flow, the gates remained open most of the time. Even so, high currents caused barge decks to submerge at the gates and caused barges to run into the sides of the gate passage, producing the highest allision rate in the nation – 165 a year. As if the threat of barge damage wasn’t enough, the problem was costing coastal commerce money. With barge lines having to be separated into individual units and assisted through the gates with double tugs, passage through the gates was often delayed. The tonnage value of keeping GIWW open was estimated at $44 billion a year. For the Corps to fix the problem and open the river would cost a fraction of that, $2.5 million. The navigational hazard had gone on for seven years. So, it was no surprise when Woodley wrote a letter to the Galveston District recommending the project. 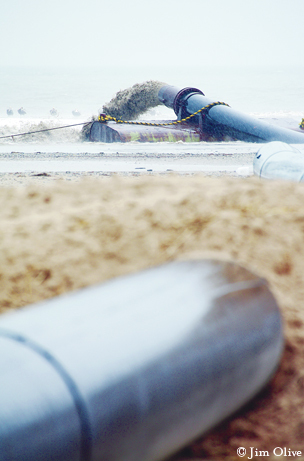 Sixteen months after Woodley’s visit, the 1.6-mile dredging effort began, in January 2009. During the seven weeks of dredging, REMSA-MESO Ecologist Kathleen McConnell, contracted by the Corps, walked the beach, dredge line and spoil area daily, counting birds, looking for tracks, and keeping watch for any disturbances. In her daily walks, McConnell was specifically on alert to spot any sign of sea turtles and piping plover habitat. Piping plover, found only in North America, are attracted to open, remote beaches, like those at San Bernard National Wildlife Refuge. But plover had only been sighted in the western quadrant of the refuge, far from the river. That would change. Within days of the breakthrough, the Edwards’ next door neighbor, Mark Hazelrigg, started seeing changes in front of his house and at the beach: the narrow channels to Pelican Lake and the first Cedar Lake — about 40 to 60 feet wide — were changing with increased tidal flow. Hazelrigg noticed silt and dead shells shifting, and the tides were now on time and much stronger than they had been for the previous two years. The Corps of Engineers reported changes, too. Its four monitoring stations positioned at each corner of the San Bernard River/GIWW intersection recorded a large increase in current and tidal flow around March 2 and an increased flow in the river – both the north and south direction and in the section of the GIWW west of the river. But, interestingly, there was no increased flow in the GIWW’s eastern section, where the problem at the gates had occurred. By March 14, the dredging project was complete, and friends of the river celebrated the river’s opening with hot dogs and champagne on a bright and beautiful spring morning, March 21. With all the boats lining the mouth of the river, families strolling the beach and Texas and American flags waving, you would have thought it was not the first day of spring, but Independence Day. Actually, it was both. With this first day of spring came the promise of new life. Indeed, new life had come to the river. And, like the Fourth of July, there was cause to celebrate the river’s freedom. In the last days of her assignment, Kathleen McConnell saw new life on the beach, too. Dunes destroyed by Hurricane Ike had started to rebuild. Sea oats were taking root and sprouting. Seagulls became too numerous to count. And, McConnell spotted the first piping plovers. They appeared along the shoreline in a new zone, the refuge’s eastern quadrant, not on one day, but each day during her last week. One of the five plovers was banded; another had only one leg. And so it was that the river returned to the sea.